Venting iron (counterbranding iron) of Antonio F. Coronel, 1840s. The venting brand was used to "vent," or cancel out, prior brands on cattle at the time of purchase. Antonio F. and Mariana Coronel hosted author Helen Hunt Jackson at their Los Angeles home and gave her the idea of using our Rancho Camulos as the backdrop for her influential 1884 novel, "Ramona," which precipitated a massive westward migration of Americans. When Jackson visited Camulos she stayed less than two hours because the lady of the estate, Señora Ysabel del Valle Cram, wasn't home. Jackson returned to L.A. where Mariana Coronel filled her in and told her the stories. Without the influence of Antonio and Mariana Coronel, Rancho Camulos would not be the legendary "Home of Ramona." Further reading: Ramona's Home: A Visit to the Camulos Ranch by Edwards Roberts (1886). This branding iron made the venta (counter-brand) of Antonio Franco Coronel, owner of Rancho La Cañada Atras. The venta was applied onto the animal's shoulder when it was sold. It overruled the original brand on the hip. The brand register and brand sample on leather were official documents registered with local authorities. Now on this day comes Antonio F. Coronel, and tenders the venta [illustrated] in the margin as the venta affirmed by him and having examined the records of Marks Brands and Counter Brands and feeling satisfied that they are unlike any in the County, and as far as my knowledge extends different from any in the State. I therefore record it as the lawful venta of the said Antonio F. Coronel, this 28th day of July A.D. 1868 | T.D. Mott Co Recorder | By S.H. Mott Deputy. From Southwestern Colonial Ironwork: The Spanish Blacksmithing Tradition by Marc Simmons and Frank Turley, Santa Fe, N.M.: Sunstone Press 2007. The practice of branding livestock with an iron, for purposes of identification, was brought from Spain and introduced into Mexico at least by 1528. Government ordinances in 1574 specified who could possess branding irons and regulated their manufacture. Blacksmiths were not allowed to make an iron unless requested to do so by the man who owned it. Ownership of each brand was established through a registry kept by municipal or provincial officials. If a smith made a branding iron not properly registered, he was subject to a fine of 100 pesos. ... In addition to private stockmen, friars also obtained irons to mark the cattle, horses, and mules in their mission herds. Moreover, an official iron, often referred to as "the brand of his Magesty," was burned on all government livestock, much as the United States Army at a later time marked its stock with the letters US. Throughout the Hispanic world, the prevailing custom was to rebrand animals each time they were sold. This meant that upon sale the old brand had to be cancelled or "vented." The venting iron was usually no more than a simple bar which could be applied over the existing brand. An inventory of 1737 for Mission Guevavi in southern Arizona lists un fierro con su venta. The fierro was a registered brand and the venta, its venting iron. On cattle ranches and at other missions, as at Guevavi, the two irons were kept together as a set. 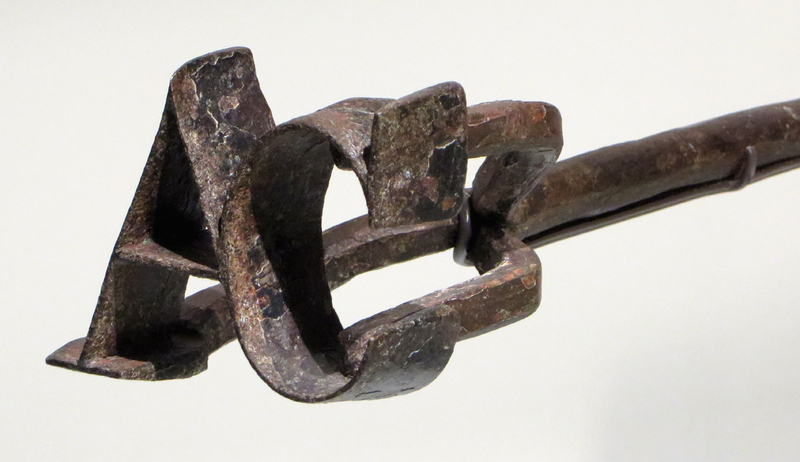 Spanish colonial branding irons consisted of an iron handle with shank, connecting rods, and a stamp, forged either of steel or iron. Irons tended to be short, 40 to 80 cms. In overall length, as compared to modern examples which run to 1 or 1¼ meters. Shanks could be of either square or round stock and averaged 1.3 to 1.5 cm. in thickness. Lap welds, still to be seen on many specimens, indicate that shanks were pieced together by the smith from odd scraps. Often, he finished off the shank with a ring handle formed as a rattail. A series of rods, normally three or four in number, connected the branding iron shank with the stamp. Ends of individual rods were either riveted or welded to the stamp. The opposite ends were fagot-welded together and the resulting unit lap-welded to the shank. Branding irons used by the American cowboy as a rule were formed of characters representing letters, numerals, geometrical forms, and pictures. These could be easily "read" or "called" aloud at roundup time when cattle belonging to different owners were tallied. Spanish brands, on the other hand, were frequently of such intricate design that latter-day cowhands of the Southwest referred to the Spanish marks as a "skillet of snakes." Some colonial irons used in the Borderlands did incorporate standard characters as part of their overall design, or occasionally even as the main element. Initials of owners and crosses were prevalent. The California padres favored a stamp using the stylized initials of their missions. An exception was Mission San Gabriel which, instead of having an iron with the letters SG, used a T superimposed upon an S. The TS stood for temblores (earthquakes). San Gabriel, because of its unstable location, was nicknamed "Mission of the Earthquakes." Whenever possible, Spanish frontier smiths used stock or tapered section for the forging of stamps. This was practical since the base of the stamp, where it joined the connecting rods, was thickest, while the face or burning surface was narrower, providing a clean line when applied to the animal. The tapered section was practical for another reason: when the branding iron was in use the thick base held the heat, allowing it to "run" continuously to the thin stamp edge. In forging, the several parts or elements of the stamp were welded, riveted, or half-lapped together before being attached to the connecting rods. Whether one or all of these joining methods was used depended upon the complexity of the stamp design. The smith often slightly rounded the edges, corners, and angles to discourage blotching when the hot iron burned the hide. LW2525a: 19200 dpi jpeg from digital image 11/23/2013 by Leon Worden.